Very often people talk about “turn something on/off” with a RaspberryPi, but you can only very rarely find something useful about reading many inputs from other systems. I needed a solution, where I'm able to read around 16 inputs which are coming from my house (lights on/off, doorbell, motion detection sensors etc.). 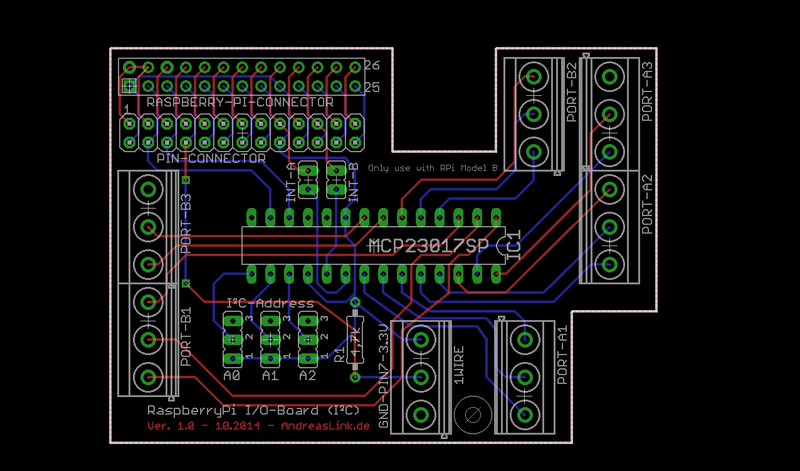 So I finally ended at the MCP23017, a very powerful I/O chip with I²C connection, this one is perfect for the RaspberryPi, so I designed a prototype in a first step. The wiring was pretty easy so far, but 16 “longer” wires on a small circuit board, well that takes some time as you might guess seeing the pics of the prototype. A lot solutions in the web explain ways how to read a GPIO-pin from the RaspberryPi in a loop (like “while (true)”), read one or more portpins many many times and if the state of a pin suddenly changes an event is triggered. But by just using python GPIO-lib and the wiringPi lib, there are a lot more possibilities, like interrupts. I used the libs to activate and react on interrupts on one pin in a short python script. The base is explained in the artice about using Interrupts with RaspberryPi. The whole idea behind my project is to read many inputs by just using - or let's say “blocking” - only one of my RaspberryPi's GPIO pins. 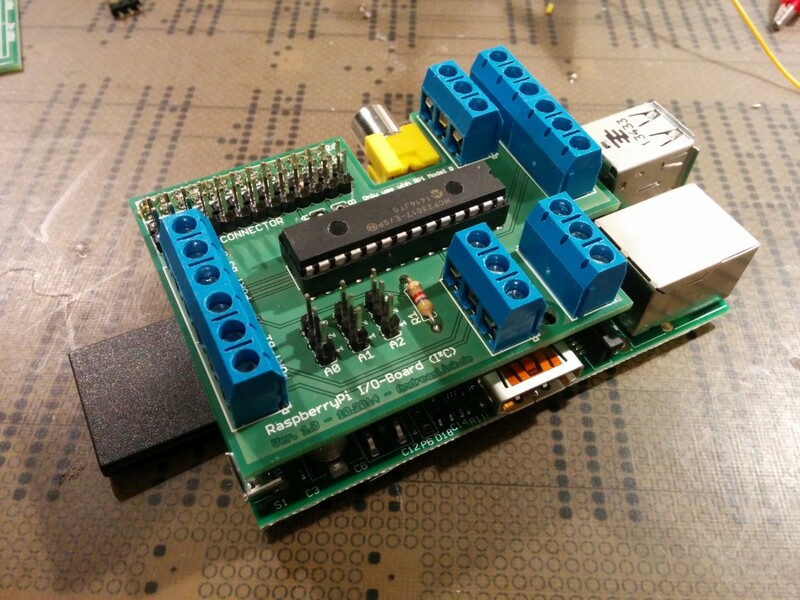 This is easily done by connecting a MCP23017 via I²C to the RaspberryPi GPIO header and connect one I/O-pin of the RPi to an interrupt pin of the MCP23017. Done. If one pin state changes (either of port A or port B) an interrupt is triggered, this triggers the Pi and the Pi just asks the state of the complete pin-sets of the MCP23017 which I (currently) finally store in a database. First I have designed a protoype that fits on an RaspberryPi Model B and - as the GPIO headers start with the same functionality - it will also fit on a Model B+. It should also fit on a BananaPi, as far as I remember (but did not test yet). I installed my prototype in the electric control cabinet of my house and it works like a charm. So I decided to create a real board, where I do not have to solder so many wires. I designed it to be easily soldered and to be able to hook one on another. By using this technique you are able to connect up to 8 boards which gives you either 128 inputs or outputs or however you set them up (more are not possible, because there are only 8 different I²C addresses possible). Bus 1 is the only interesting one, so having the first one (bus 0) failing, it does not matter right now. Important is, that address 0x20 is free here, which is proved by the “–”. If the 20 will show up there, it's ensured, that the I²C connection via SDA and SCL is working so far. # Parameters can be specified after the module name. Now all prerequisites should be done so far. 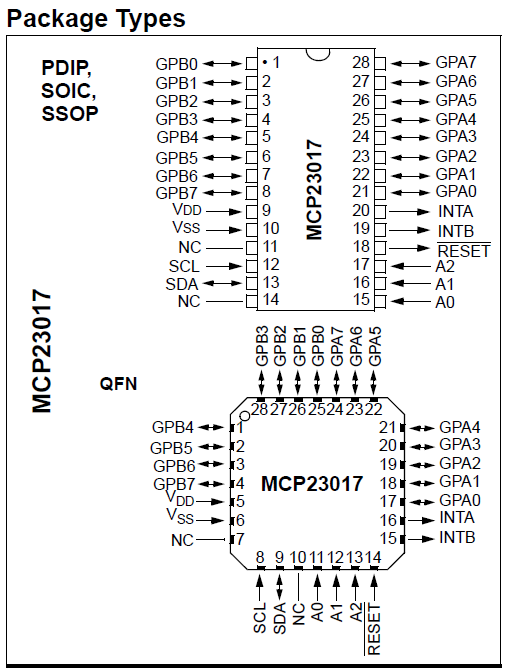 The MCP23017 is an I/O chip with 16 pins (split over two ports A and B with each having 8 pins), that can be set either as IN or OUT pins. By Googleing the datasheet you get the most information out of the datasheet. 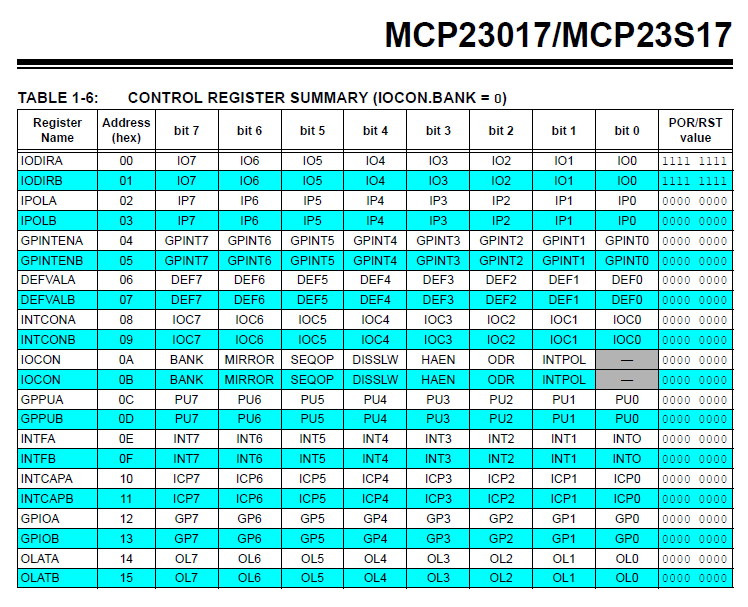 Here you also find an overview about the register of the chip and you can easily find out how to init the MCP23017 to work as needed. Here 0x20 is the default chip address and 0x12 represents the complete port A. These bits represent the status of the pins of port A. When the MCP23017 is correctly installed, it has to be initiated via I²C to be prepared to trigger interrupts and to define all pins as IN-pins and so on. Here it's very useful to have the datasheet beside. Without the datasheet the setup would have been impossible, as the right registers/addresses to setup have to be known. Googleing the datasheet should be the fasted way to find it, if not already done within the former step. Every time the MCP23017 looses it's power, the init steps have to be done again! Don't forget to read the ports at the end of the init procedure as the reading resets the interrupt signal! Doing this ensures to have a clean start afterwards. The board has one MCP23017 (PDIP) installed and 16 connectors for the corresponding I/Os. For each set of connectors of one port, ground is also set on a connector pin. This makes it easier to connect one pin to ground as ground is right there available. The connector in the middle is prepared for 1wire devices like a 1wire temperature sensor. Ground, 3.3V and the typical datapin (Pin 7) are prepared here. A DS18S20 temperature sensor could easily be connected to the connector here and will work out of the box with the standard rasbian 1wire modules. 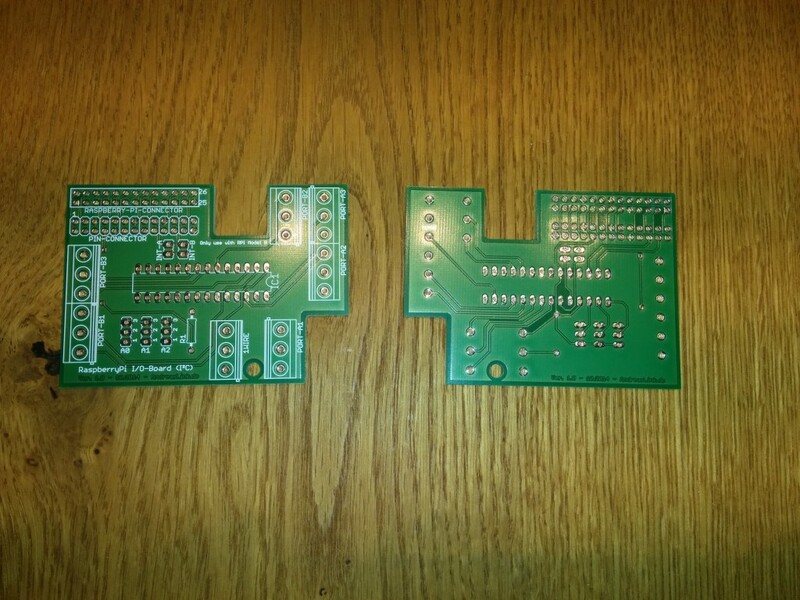 The other two jumpers are prepared for the interrupt pins of port A or port B of the MCP23017. This opens the possibility to either use the MCP23017's pins as IN-put or OUT-put pins. If the board is used for OUT-pins only, no interrupts are neccessary and the interrupt pins could stay unconnected, so they can be used with other functionalities on the RaspberryPi. As one port or even one single pin can be used as either IN or OUT, the usage of the two possible interrupts is totally free. So feel free to jumper the interrupt, that is needed - or even jumper them both. I soldered usage of interrupt A as I don't need the pin for other things. When using the MCP23017 pins as OUT-pins, don't use them directly as they are only delivering very low current. When using in OUT-mode, send the signals e.g. into optocouplers or create transistor amplifier ciruits. This prevents the MCP23017 from beeing killed. This step is of course optional and is only needed when the values, that have changed, shall be inserted and stored into a database - probably to be interpreted by other software afterwards. The IOevents table stores the history of all events having triggered an interrupt, so all changes are currently stored. This might not be relevant for every project, but I like having the history (here I can see, when the postman rang the bell ). These scripts might easily be executed within phpMyAdmin in a database of your choice. Please remind the DROP TABLE IF EXISTS in before of every script. Just to ensure, nothing is deleted, that might already be existing. Setting up a dedicated DB-user could be worthwhile but is not neccessary. This is the final python script running on my RaspberryPi in the electric control cabinet; it includes all former steps and requires all former described steps to be executed. If the script is started, it initiates the MCP23017, inititiates the DB connection and updates every 60 seconds aka every minute the timestamp in the status table. This could be used to be interpreted by a watchdog service, if the watchdog detects an entry older than 2 minutes, the script probably might have crashed. Whenever any portpin of the MCP23017 is pulled to ground, an interrupt is triggered. Within the execution of the trigger, first port A and then port B is read and their current states are stored into the DB. After reading the ports, the interrupt is automatically reset. When using this script or modifying it, it would be nice to refer to this website, thank you. print "Init MySQLDB: host 'localhost', user 'dbusername', DB 'homebus'"
print "Connection to DB lost, trying to reconnect..."
print "Init MCP23017 (", hex(DEVICE_ADDRESS), ")"
print time.strftime("%d.%m.%Y %H:%M:%S"), "Interrupt triggered... reading I2C-bus:"
print "A-Pin 0 = true"
print "A-Pin 0 = false"
print "A-Pin 1 = true"
print "A-Pin 1 = false"
print "A-Pin 2 = true"
print "A-Pin 2 = false"
print "A-Pin 3 = true"
print "A-Pin 3 = false"
print "A-Pin 4 = true"
print "A-Pin 4 = false"
print "A-Pin 5 = true"
print "A-Pin 5 = false"
print "A-Pin 6 = true"
print "A-Pin 6 = false"
print "A-Pin 7 = true"
print "A-Pin 7 = false"
print "B-Pin 0 = true"
print "B-Pin 0 = false"
print "B-Pin 1 = true"
print "B-Pin 1 = false"
print "B-Pin 2 = true"
print "B-Pin 2 = false"
print "B-Pin 3 = true"
print "B-Pin 3 = false"
print "B-Pin 4 = true"
print "B-Pin 4 = false"
print "B-Pin 5 = true"
print "B-Pin 5 = false"
print "B-Pin 6 = true"
print "B-Pin 6 = false"
print "B-Pin 7 = true"
print "B-Pin 7 = false"
print time.strftime("%d.%m.%Y %H:%M:%S"), "Watchdog activ -> Waiting for a new interrupt..."
print "Lost DB-connection, trying to reconnect..."
Thank you for reading, implementing and testing . Feel free to improve and extend these scripts (I'm not a python professional, so there is a lot room to improve) with own ideas. Remind: This page/article is still in progress, I might probably extend or optimize some sections. Feedback could be returned via Google+.